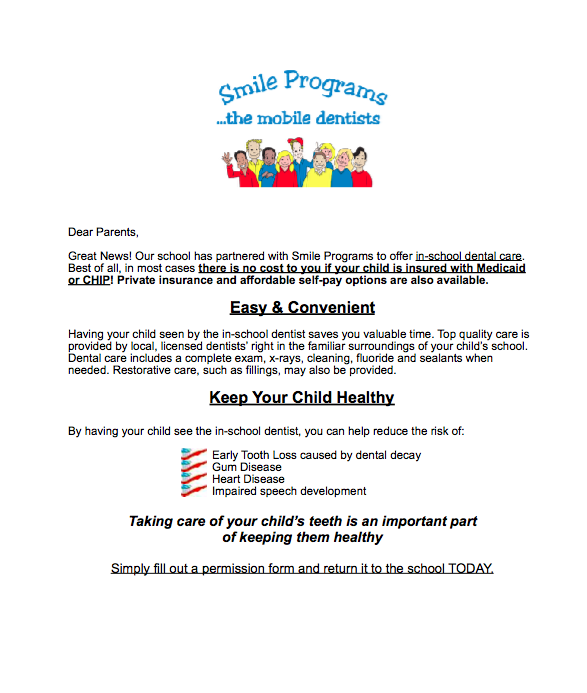 The district is partnering with Ohio Smiles to provide dental care to students. Dentists will visit each school building to provide exams, preventative and restorative care to students who participate. In most cases there is no cost to the family if the child is insured with Medicaid or CHIP. Private insurance and affordable self-pay options are also available. Having students seen by the in-school dentist saves families valuable time. Top quality care is provided by local, licensed dentists’ right in the familiar surroundings of the child’s school. Dental care includes a complete exam, x-rays, cleaning, fluoride and sealants when needed. Restorative care, such as fillings, may also be provided. To participate contact your building health aid or nurse.